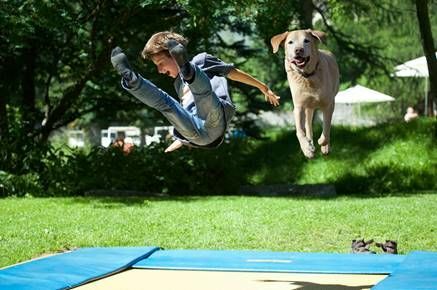 World’s first trampoline park for dogs. Rover.com is launching the world’s first trampoline park for dogs. The Dog-poline sessions offer owners and dogs a fun, invigorating experience during the cold winter months when owners and pets are usually stuck inside. Owners can sign up for free 10-minute sessions at ZAPspace in Stratford, London, where dogs can let their fur down and bounce the afternoon away. Well-behaved owners are also welcome on the trampoline. Every dog will need to pass the vet check before taking to the trampolines.